or Don’t Be A Hanging Banana! As I regularly encounter folks who don’t know the optimal way to lie in a hammock, I thought I would start with a bit of tutorial. Most new hangers climb into a hammock and hang folded like a banana. They put their head at one end and their feet at the other, lying in a straight line. This is how I started sleeping in a hammock, and I complained about my sore back. 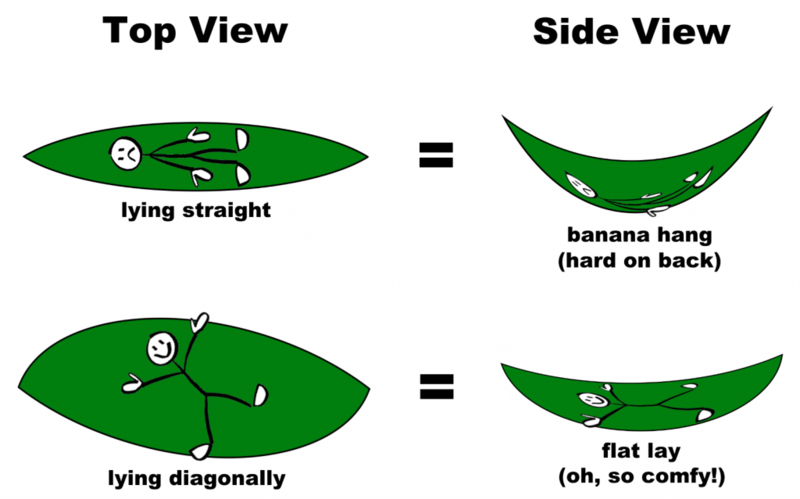 The right way to sleep in a hammock is at a diagonal slant to the hammock. This lay flattens the hammock out, making for a comfortable night’s rest. Hammock hangers call this the “Sweet Spot.” During winter hiking, I have spent as much as 12 hours lying in a hammock (sleeping, reading, etc.) without any of the discomfort I find in lying in my bed too long. Follow “The Adventures of Goose” on Facebook to see my photos, videos, & gear reviews!